I can't believe it's already over! I'm kind of sad. 😢 Take heart though. We have Spring Into Horror coming all month long in April and SciFi Summer coming the first two weeks in June AND, of course, we always have our Facebook group where we can interact in between time. 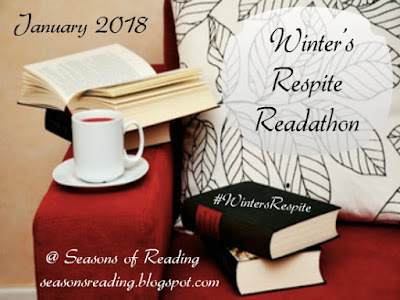 Feel free to share any reading doings you have going on any time, not just during readathon time. I'd like to thank you all for joining me. Be sure to add your wrap-up link below and please double check that your name is listed in the sign up/starting line linky at this post so you will be eligible for the giveaway. You will also need to fill out the form on the mid-event check in page/prize page if you would like to win a prize. You have until Sunday, February 4 at 11:59 pm central time to add your wrap-up link and to fill out the form for prize entry. I will draw giveaway winners in the following few days after the wrap-up deadline so keep a look out in your email inbox (or spam folder, just in case) for an email from truebookaddict. (Please be sure to note the system of drawing winners in the giveaway details on the prize page). I'd like to thank Elyse LeMieux for the generous prize donation.